Ideal for powering PDUs servers UPSs and many more devices and appliances which use the IEC-60320-C20 inlet. China to C19 power cord. GB2099 larger industrial China 3P plug to IEC C19 with RVV/H05VV-F 1.5mm_ black wire. 10 feet with China CCC approval. Brazil industrial to C19 power cord. NBR14136 (aka IEC 60906-1) Brazil industrial 3P plug to IEC C19 with H05VV-F black wire. 10 feet. Rated up to 16A 250V. Brazilian INMETRO certified. Japan to C19 power cord. JIS C 8303 standard Japan 3 pin plug to IEC C19 with VCTF 2.0mm_ black wire. 10 feet and PSE approved. NEMA 6-20P to C19 power cord: NEMA 6-20P USA 3 pin plug to IEC C19 with 12/3 SJT black wire; 6 feet with UL and CSA approvals. Rated up to 20A 250V. 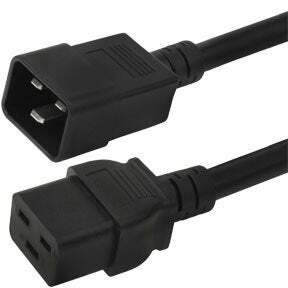 NEMA 5-20P to C19 power cord: NEMA 5-20P USA 3 pin plug to IEC C19 with 12/3 SJT black wire. 6 feet UL and CSA approvals. Rated up to 20A 125V. Ideal for data center and server environments. Australia to C19 power cord. AS3112 Australia large industrial 3P plug to IEC C19 with H05VV-F 1.5mm_ black wire. 10 feet with Australia SAA approval. This Australian power cord is also referred to as the AS3112 to C19 mains power lead or AS 3112 to C19 mains cable. NEMA L6-20P to C19 8 foot power cord. NEMA L6-20P to IEC C19 with 12/3 SJT black wire 8 feet. cUL approval. Rated up to 20A 250V. The 60320 C19 IEC power cord receptacle is commonly used in high power data center and server environments with devices such as servers, PDUs and other data center and network gear. These IEC C19 power cords are available for any country worldwide as well as extension cord versions commonly known as C19 to C20 power cords or C20 to C19 power cords. We can also build up power cords with your desired configuration. You can email or call us for the facility. We offer high quality products at competitively low prices. All of our products are RoHS compliant and environment friendly. You can also expect a commendable after sales service and lifetime technical support on all products we offer.